Looking for a fun, easy way to relieve stress while stuck at your desk or in traffic? Look no further. Google stress putty is non-toxic and doesn't stain, and is endlessly satisfying to shape and squeeze. 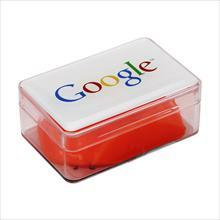 Comes in a handy storage pot, in all four Google colours. Comes in a transparent plastic container. * We're not sure exactly when but Silly Putty appears to be no longer available.